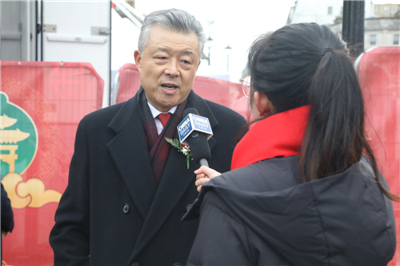 On February 10, 2019, Ambassador Liu Xiaoming gave an interview to China Daily at the Chinese New Year Celebration at Trafalgar Square. China Daily has conducted bilingual live video broadcast through its social networking platforms including Facebook, Twitter, Weibo, and APPs. The following is the full text of the interview. China Daily: Ambassador Liu, on the occasion of celebrating the Chinese New Year, what do you like to say to the Chinese worldwide? Ambassador: Here at China Daily, on behalf of the Chinese Embassy in the UK, I want to extend our very best wishes to the Chinese all over the world. A healthy, happy and prosperous Year of the Pig to everyone! China Daily: Thank you! As you mentioned in your speech, this is your ninth Trafalgar Square Celebration since you became the Chinese Ambassador to the UK. Over the past nine years, have you noticed any changes in the Chinese New Year Celebrations in London? What have caused these changes? Ambassador: First, the celebrations have taken various forms, grown in scale and become increasingly more popular. Trafalgar Square celebration has become a global brand. It is the largest Chinese New Year celebration outside Asia with the largest number of people. The first celebration was held in 2003 by London Chinatown Chinese Association. It has grown in scale over the past 17 years, attracting 500,000 to 700,000 people every year. The reason for such enthusiasm is clear: China has become more developed, and its international status and global influence are increasing. People of all countries, including Britain, would like to know more about China. The growing popularity of the Chinese New Year also has to do with the growing relationship between China and the UK. In 2015, President Xi Jinping paid a successful visit to the UK, unveiling a “Golden Era” in China-UK relations. The bilateral relations are getting closer and closer, not only in trade and economic fields, but also in people-to-people and cultural exchanges. The key to sound relations between states lies in the amity between the people. I am delighted to see closer people-to-people and cultural exchanges between the two countries. Right now, there are 180,000 Chinese students in the UK, and over 10,000 British students in China. Confucius Institutes and Classrooms are developing rapidly in the UK, faster than in any other countries in Europe, having 160,000 registered students. That means there are 160,000 young people learning Chinese in the UK. Over 600 primary and secondary schools offer Chinese courses. Chinese has become the third most popular subject of foreign languages in A level exam last year. I was told by my British friends that in the near future, Chinese might be the most popular foreign language in the UK. British people are fond of the Chinese New Year, Chinese culture, lion dance, dragon dance, hanging lanterns and the most important is they want to learn the Chinese culture. I think the Chinese New Year in the UK has its own characteristics. I have attended the Chinese New Year celebration in Number 10 Downing Street for seven times over the past nine years. In the past, the guests of the celebration were mainly representatives of overseas Chinese and Chinese institutions in the UK and people from various sectors of Britain. The Prime Minister delivered a speech. This year, it was very special and the “taste” of the Chinese New Year was even stronger. For the first time, Number 10 was decorated with red festival couplets and paper-cutting. There was lion dancing and the Prime Minister dotted the eyes of two “lions”. She also did paper cutting. The Chinese New Year party in Downing Street epitomizes British people’s increasing enthusiasm for the Chinese New Year. China Daily: Looking at it now, how do you evaluate the contribution of the Chinese community to the British society? Looking ahead, what are your expectations? 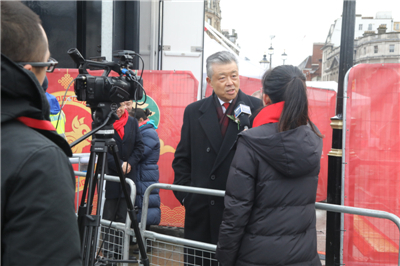 Ambassador: Through the Chinese New Year celebration, the Chinese community has brought the Chinese culture and tradition to the UK. On the one hand, they are integrated into the British society. From the message of congratulations of the Prime Minister and the speech of the Mayor of London we can see that they appreciate the contribution of the Chinese community to the economic development and social progress of the UK. On the other hand, by hosting the Chinese New Year celebration, British people have a better understanding of China, which bring the two great nations and peoples closer. I think that London, the international metropolis, is embracing the Chinese community. These events held in London have created more “golden fruits” for China-UK “Golden Era”. There is another significant event this year. The 15th World Chinese Entrepreneurs Convention will be held in London. Chinese entrepreneurs from all over the world are going to gather here. I think this will highlight the increasing role of the Chinese community in the British society and their expanding influence. They will continue to make important contribution to China-UK relations. China Daily: Thank you for the interview. As you talk, the clouds over London today has dispersed. 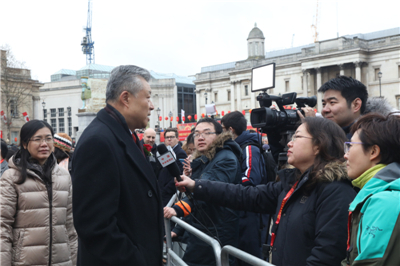 At the Chinese New Year Celebration at Trafalgar Square on the day, Ambassador Liu also gave interviews to CCTV, Xinhua News Agency and Nouvelles D’Europe UK Edition.